This is a simple, quick and easy recipe I use to make incredibly tasty ribs. 1. Clean Ribs, Wash and remove excess fat. 2. Turn Ribs over, slip finger under white membrane on back side of ribs, remove as much as possible. 3. Removing the membrane exposes the meat and allows the seasoning to permeate more of the meat imparting flavor. 4. 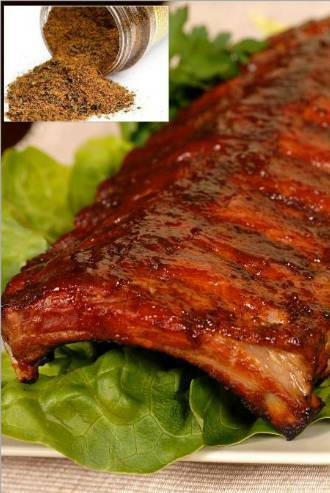 Place ribs on a baking sheet or foil and generously shake on Jake's Tri-Tip, Steak and Rib Rub, both sides. 5. Allow ribs to rest for 45 minutes. 6. Prepare grill. Oil grill rack to help prevent sticking. 7 We'll be cooking with indirect heat so wherever the fire is move the ribs to the opposite side. 8. Close barbecue grill lid. 9. Check back in 10 minutes to make sure grill isn't too hot and that ribs are not burning, close lid. 10. Check 10 minutes later and turn ribs. 11. For the remaining time leave lid closed for 15 minutes each time turning the ribs after checking. 12. Check Ribs with meat thermometer slipping the sensor between the rib bones. Follow temperature guide below. 13. Once done, remove and let rest for 2-3 minutes.